Pattern Description: Round flat bottle, with a circular design in the middle. Similar Patterns: Mini President bottles by Wheaton. 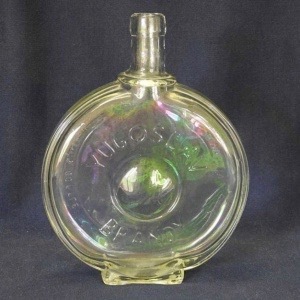 The manufacturer and date of this pattern is unknown; the bottle is clear iridized. Yugoslav is Serb-Croatian or former Yugoslavia. The bottle was probably made for a special brandy production. The word Yugoslav around the top of the bottle and Brandy is printed around the bottom. The size is unknown.